Woohoo! Had an awesome money saving week! Giant Eagle has some awesome deals! First, achieving goals in any area give me confidence in all areas. It’s really helpful to have that extra boost of confidence in an area that you do fairly well at to help you with the areas that you struggle most with. And our current goal is to pay off my student loan, and we’re getting awfully close! Second, I have struggled with balance by focusing so intensely on one area (and I do think intense focus is good) to the neglect of other areas. I think it’s fine and good to focus and prioritize my weight loss a little more than paying off my debt, but I still need to be able to keep all areas under control. Third, hey, some of this food is pretty healthy, like the Dannon yogurts.And the lunchanbles are 220 calories (or 4 pts) each. Not bad. 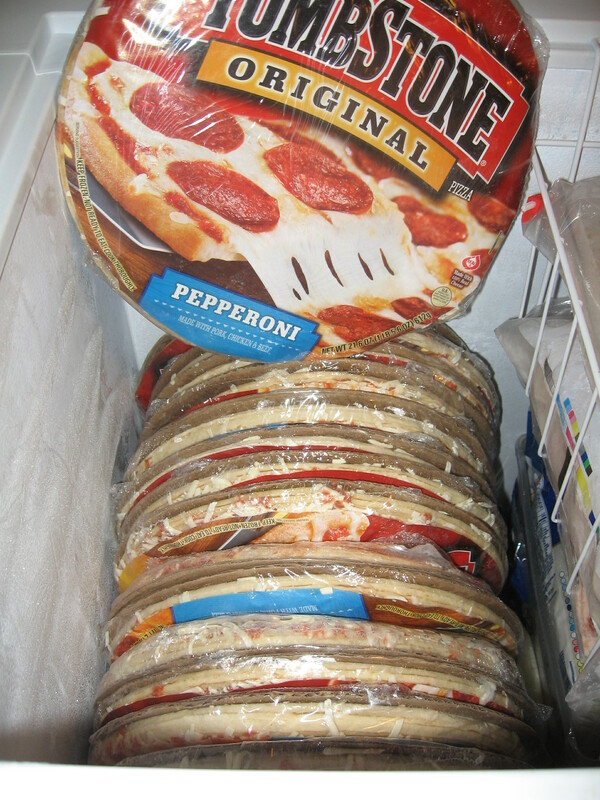 Now, for the pizzas. This is mine and my husband’s personal approach. He eats the pizza, which are super cheap, freeing up some money for me to eat higher priced fresh produce and things like that. Luckily pizza isn’t a trigger food for me, so I’m fine cooking it for him, and then eating a grilled chicken salad for me. (He has absolutely no weight struggles – couldn’t gain an ounce if he tried.) And he’s never jealous of my salad when he’s eating pizza!! One thing I do need to work on is actually using that extra money for healthy items, instead of saving it to put on the debt. 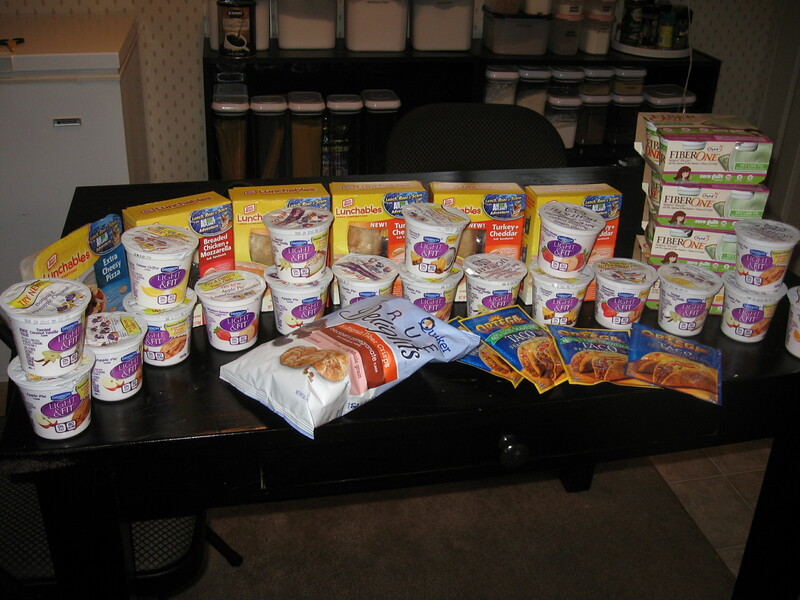 That’s 20 Dannon yogurts, 7 lunchables, 4 – 4 packs of Fiber One yogurt, 4 packets of Taco Seasoning, and rice cakes. For once, I really lucked out on a CVS deal! 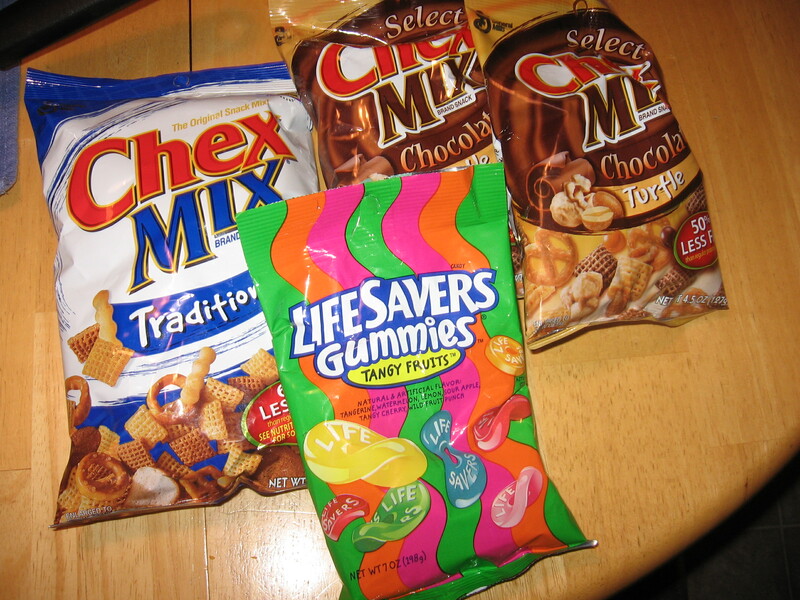 First of all, there is another bag of Chex Mix and another bag of Lifesavers that aren’t pictured here. Since I live by myself, I find myself going overbudget trying to get good deals that I really don’t need. I spend money on things I wouldn’t buy anyway just because they are a “good deal.” I am really working on only spending on money on things I really, really want or would need to purchase anyway. So I have no ECBs built up. So I got 4 bags of Chex mix and 2 bags of Lifesavers for $0.01 (one cent) out of pocket. (No ECBs coming back, though.) But not spending anything was good. The Chex Mix was on sale for $1 and I printed two dollar off coupons from the internet. The Lifesavers were B1G1 and I had B1G1 coupon which made both bags cost nothing. The good news is that when I bought the two bags of Chex Mix, everything was free even without my coupons! So I got to go back to CVS and still use the two coupons to get two more bags of Chex Mix! You are currently browsing the archives for the Financial category.